Rangers will be able to borrow as many as nine Newcastle players in a deal that will see Magpies owner Mike Ashley buy a share in the Ibrox club. The Scottish FA is set ratify the move on the condition Ashley owns no more than 10% of Rangers and has no personal role in running the club. 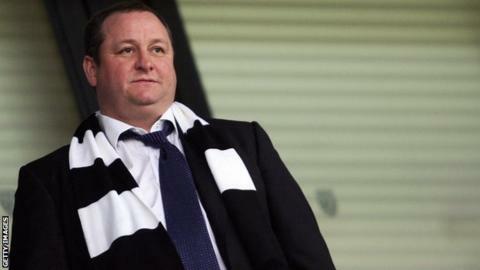 Ashley's Sports Direct firm will then take over Rangers' replica kit merchandising operation. Negotiations are under way with JJB Sports to end their retailing contract. JJB Sports and Rangers entered a 10-year merchandising contract in 2006, when the Glasgow club received an initial payment of £18m with a guaranteed minimum annual royalty of £3m. Any Newcastle players switching to Rangers on loan would need to do so before the end of this month, when a year-long signing embargo comes into place for the Scottish Division Three club. In February, Rangers went into administration owing up to £134m to unsecured creditors. As a result, its registrations with the Scottish FA and Scottish Premier League were terminated. Businessman Charles Green led a consortium to buy Rangers' assets for £5.5m and reformed the club as a new company. But the 'newco' did not get the required votes for re-admittance to the SPL and instead, the new Rangers were relaunched in Division Three, drawing 2-2 with Peterhead in their opening game. Under the terms of the agreement with Newcastle, Rangers are also likely to play the Magpies in a friendly. Ashley spent £134m to assume control of Newcastle in 2007. Green hopes to announce other new investors in the club shortly.